Number 20 in the Clean Air Technologies Series. Reducing (if not completely eliminating) particulates from the atmosphere – typically introduced via the burning of fossil fuels – and therefore lowering exposure to such pollutants, would go a long way in not only helping improve the quality of the air we breathe but that of life as well. Meanwhile, if inhaled, fine particulate matter (PM 2.5) can lodge deep in the lungs and enter the bloodstream. Prolonged exposure to fine particulates may increase a person’s risk of heart attack and stroke. 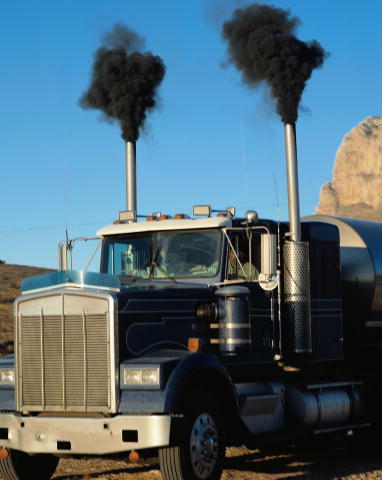 It, no doubt, is with the above key considerations and others in mind, namely, that “The transport of people and goods consumes nearly three-quarters of the nation’s petroleum, emits around a third of greenhouse gases, and is responsible for around half of urban air pollution,”1 that extensive if not exhaustive work aimed at ridding the air of contaminants has been ongoing. In California, think Assembly Bill 32 (the Global Warming Solutions Act of 2006) and Senate Bill 375 (the Sustainable Communities and Climate Protection Act of 2008). One such effort is being advanced by biogas producer Oberon Fuels. But what if DME production were upped significantly? Doing just that would be far-reaching in terms of its implications in my view, not just with regard to diesel application in the transportation arena but outside as well. Imagine the exhaust of diesel, regardless of application, with 95 percent less CO2 and completely absent of particulate matter. For that matter, imagine any exhaust free of air contaminants. I truly believe that day is coming and will be here before we know it. “UC Transportation Center: About UCTC—Our Theme,” University of California Transportation Center, http://www.uctc.net/about/theme.shtml.